PowerPoint is a leading presentation software program. However, the software can be expensive, and it is not the most feature-rich on the market. We looked at several PowerPoint alternatives that are more cost effective, easier to use, or include tools to generate more modern presentations to determine the top six best competitive options. 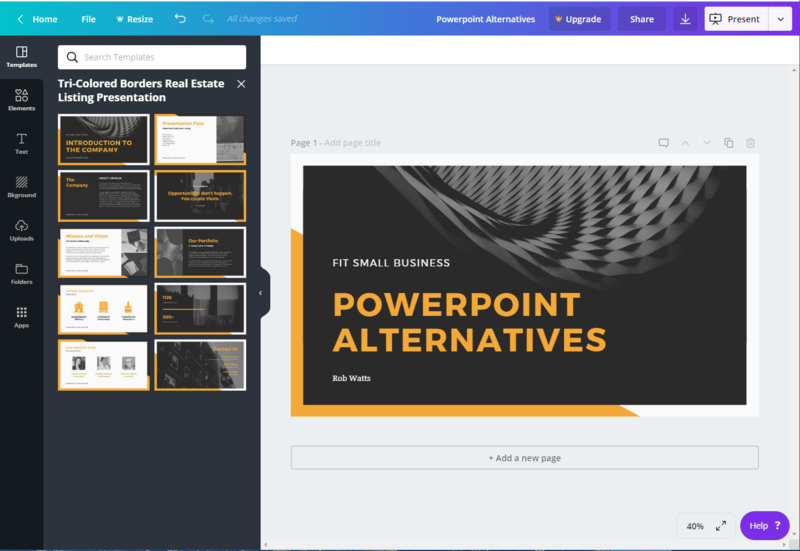 Above all else, good alternatives to PowerPoint should allow businesses to make effective presentations with an easy-to-use set of tools to create, edit, and share slides. Alternatives should be more affordable than PowerPoint, offer unique features, or both. Apps should also give users control over how the slideshow looks and behaves in terms of transitions and animations. Cost – The overall price of the platform should be affordable for most businesses. Ease of Use – Presentation apps should be easy to use and understand. Editing Tools – The alternative should allow users to add custom text, visuals, or colors to their presentations. Templates – PowerPoint alternatives should offer ready-made templates for users who don’t want to build presentations from scratch. Audience Interactivity – We looked for platforms that promoted audience feedback or allowed presenters to address questions or offer polls during presentations. Presenter Tools – We compared notes, pointers, and narration options helping presentations be more effective. Based on the criteria above, we find that Google Slides is the best choice for most small businesses looking for a PowerPoint alternative. It’s free to use and has all the tools you’d need to make powerful business presentations. It even lets your audience ask you questions and provides notes and a virtual laser pointer for presenters. Google Slides is part of the company’s suite of business productivity and collaboration software, which also includes Docs, Sheets, and Forms. Google Slides is easy to use, with a robust set of tools to let you create presentations as you see fit. Best of all, it comes free with personal Google accounts or comes bundled with the paid G Suite service. Therefore, Google Slides is our best overall pick for small business PowerPoint alternatives thanks to its collaboration and customization tools. Google Slides comes free with any personal Google account, and also comes bundled with the G Suite platform for business email accounts, which costs $5 to $10 per user per month. All the apps we compared have a free version, but only Slides offers all of its features regardless of plan selected. Additional 100GB of storage is available for $1.99 per month. Google Slides lets you create and present slideshows quickly and easily with plenty of templates to choose from. You can even import PPT files, so you can work on existing PowerPoint files if need be. 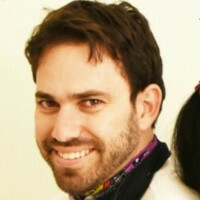 It also allows real-time collaboration, making it great for teams that are working on important presentations together. 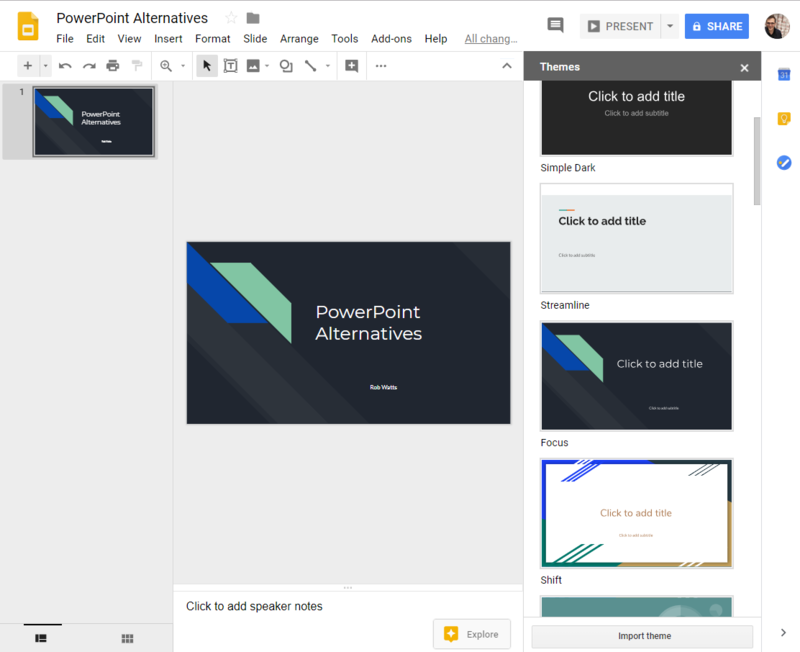 Google Slides’ interface will likely remind you of PowerPoint, and comes with a basic set of tools for creating slides, formatting text, and inserting animations into slides. Like PowerPoint, you can transform data from your Excel and Google Sheets spreadsheets into graphs, and also insert image and videos from just about any mainstream file type. Google Slides, however, does not offer the flashy animations offered by Prezi or the automatic slideshow creation of Slidebean, but does have the same basic options like fade transitions and fly-in animations. Its editing tools are also basic, but good enough to create a slideshow that looks professional and aesthetically pleasing while fitting the needs of teams of any size looking for low-cost alternatives to PowerPoint. Google Slides is used by all types of users, and as such, you can create your own slides from scratch or choose from 26 templates. You could use them for business use and just edit them as you see fit. You can also use designs from third-party sites like SlidesCarnival, which offer hundreds of free templates with striking designs. The template selection is small, especially compared to PowerPoint, which has more than 100 designs to choose from. Canva, too, has a wide range of templates at over 50,000. Still, Google Slides is good for any team that is either comfortable with a small set of basic templates, or doesn’t mind doing some searching for third-party templates. Slides has apps for iOS and Android devices, which allow you to use your phone as a remote to control presentations when your computer is connected to the TV or projector. You can’t do this in PowerPoint without getting a third-party app. It also offers presenter tools like private notes, a pointer that lets you highlight items on-screen, and a basic Q&A tool that lets your audience go to a URL on their device and ask questions to presenters. This is a pretty robust set of presenter tools compared to other alternatives. Canva offers presenter notes, but no pointer or Q&A option. Unfortunately, Google Slides is missing audience behavior analytics features found in more robust alternative plans, and the ability to submit polls and surveys like in Swipe. However, it is still a great free option for any team that wants interactivity with their audience and to save notes on their presentations. Like all of Google’s business apps, team members can be signed into the same Slides presentation, make edits, and comment on slides. You can set permissions as to who can see, comment on, or edit your content. However, collaboration extends past the slide deck, as teams can then work together on linked Google Sheets or other embedded documents. This is a great option for teams that are working together and want to update presentation data in real-time. Google Slides offers plenty of features for creating respectable-looking presentations. With that said, your presentation will be very similar to the PowerPoint slideshows people have been seeing for decades. If you want something a little more striking, Prezi uses a whiteboard-based design that delivers content featuring dramatic zooms and rotations. Users are very impressed with how useful Google Slides is, especially for a free tool. Collaboration features are especially loved by remote teams, and most customers find the platform incredibly easy to use. There are complaints about some features being broken when Google issues updates to the platform, but those customers have also noted that the company is quick to fix the issues. It’s hard to imagine a scenario where Google Slides wouldn’t be beneficial. It’s free to use, offers all the tools you’d need to make an effective presentation, and even offers real-time collaboration and presenter tools. Click here to start using Google Slides today. Slidebean is one of the newer PowerPoint alternatives to enter the market. Starting at $24 per user per month, Slidebean will automatically create and format a presentation for you once you’ve entered your text and images. The advanced version even offers analytics. The quality of these slideshows is high, and they offer an aesthetically pleasing look. It’s our pick for businesses that want automated help for creating distinguished and visually arresting presentations. You can start building Slidebean presentations for free, but you’ll need to pay to share your presentations with others. Plans cost either $96 per year for the Starter edition or $228 per year for the Premium version. Slidebean is expensive and the only platform we looked at that does not offer a free edition. The Starter edition gives you access to a core set of slide building tools. You can collaborate on projects with your teammates, present your content online, and access the company’s library of basic, peer-generated templates. PowerPoint offers no such community-made content. Then simply add your text and images and have Slidebean apply it to the presentation layout for you. Like the free version of Canva, this tier forces you to choose from the company’s limited color palette, and could be frustrating for design-savvy users. This makes the starter plan best for teams that want to create professional-looking slideshows online, but don’t need granular control over how the content is displayed. The Premium version gives you analytics, the ability to add your own branding and fonts to presentations, and access to the company’s “Premium Content Templates,” which are curated by the company itself. You also get priority support if you need assistance using the platform, which PowerPoint does not offer. It does not offer a service uptime agreement like Prezi’s top-tier version, however, nor does it allow you to ask questions of your audience in real-time. Therefore, this version of the platform is best suited for teams that want to gather audience insights from their presentation software in addition to having the content of their presentations laid out for them. It’s impressive that Slidebean can “create” slideshows for you, but most of the presentations don’t look much more advanced than something you could create on Google Slides yourself. If you would rather spend time inserting animations and transitions for yourself, then you may want to consider Google’s product instead. Users love the ability to enter content and have a presentation built around their text and images. They also rave about the aesthetics of the presentations, which can make even the smallest companies look like today’s hottest, hippest startups. However, there are complaints about frequent bugs and system hiccups. Slidebean makes it extremely easy for non-technical users to quickly create professional-looking presentations. If you have struggled in the past to make your PowerPoint slides look nice, then you should check out Slidebean. You can start using the service for free to see all it has to offer. Get started today. Swipe is a slideshow platform with a design focus on audience feedback; it has a free plan as well as paid plans starting at $15 per month. In addition to editors for content and transitions, Swipe lets you administer social polls during your presentation and tracks engagement behavior, telling you when, where, and how the presentation was viewed, as well as how long your audience viewed each slide. Swipe is good for companies that want to gather audience data and read insights. Swipe’s free version allows you to make up to five presentations with unlimited users. Paid plans range from $15 per month for unlimited users on the Pro plan to $36 per user per month on the Business Plan. This puts it in line with other presentation software in terms of affordability. The free version gives you access to all of Swipe’s building tools, but limits you to just five presentations. It also doesn’t give you analytics or the ability to protect sensitive information with passwords, but you can put audience feedback modules into presentations with interactive polls. Users then respond to polls by clicking on responses, and it’s a feature supported in both live and recorded versions of your presentation. There is currently no way of polling your audience directly in PowerPoint without the use of a third-party plug-in. This makes the popular app look archaic when compared with Swipe. This edition of the platform is good for companies that simply want to try out Swipe for themselves and upgrade to a paid plan later. For $15 a month, the Pro edition offers unlimited presentations, analytics, and privacy measures for your presentations. PowerPoint offers analytics as well, but does not offer live polling in any capacity, meaning you would need to use another piece of software to administer audience surveys following your presentations. Despite its feature set, this version is substantially more expensive than the monthly cost of either the Starter version for Slidebean or Haiku Deck Pro. It also lacks the choice of templates found on other solutions. Therefore, this platform is best for businesses that want a presentation tool designed for on-going audience interaction. The Team edition is $3 more per month, putting the cost at $18 per month. However, the only key difference between it and the Pro plan is it adds priority support. This means that if you contact the company for help, you will be put in contact with a representative before customers who subscribe to lesser tiers or service. PowerPoint offers no similar support option, but unless you have constant problems with the platform, you probably won’t need this tier of service. This top-tier version of the software adds Visitor insights, which gives you information on how long users viewed each of your slides, as well as what time they looked at your content. This information can be leveraged to let your team know what clients and associates find most interesting about your presentations. It also offers CRM integration that connects data from these insights with platforms like Zoho and Salesforce. At $36 per user per month, this is the most expensive tool we looked at. This could make it unaffordable to some smaller teams. Despite that, it could be a perfect fit for companies that want to gather rich insights from their presentations and automatically export that information to their CRM. Swipe excels at offering interactive audience social polls. If you don’t need these, however, then Swipe’s slide building tools aren’t nearly as robust as the other services we looked at. Google Slides also offers a wider range of templates to choose from as well as the ability to configure more options about slide behavior and design. Professionals who deliver informational seminars and other types of presentations love the audience polling features in Swipe. Users also report that the platform is incredibly easy to use. With that said, users feel that getting used to the interface does take some time. Swipe offers a wealth of features that let you turn your presentations into opportunities to learn from and interact with your audience. Unique features like viewer behavior tracking and CRM integration make this great for companies that want to efficiently convert viewers into new clients and associates. Get started with Swipe today. Haiku Deck is perhaps the best presentation software out there for editing on your iPhone or iPad as PowerPoint alternatives go. Though there is no Android version, it boasts the best mobile app out of all the platforms we looked at. It even comes with an AI assistant that can automatically insert images and formatting. 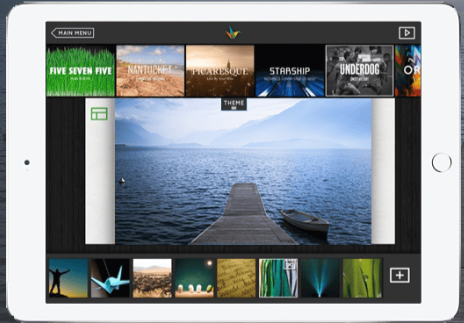 This makes Haiku Deck ideal for iOS users who want to create presentations on the go. Haiku Deck’s free basic version allows you to create one presentation. Paid plans start as low as $9.99 per month for the Pro version and go all the way up to $29.99 per month for the Premium version. This makes it among the more affordable options we compared. Haiku Deck’s free Basic version allows you to start building presentations on your desktop or mobile device. 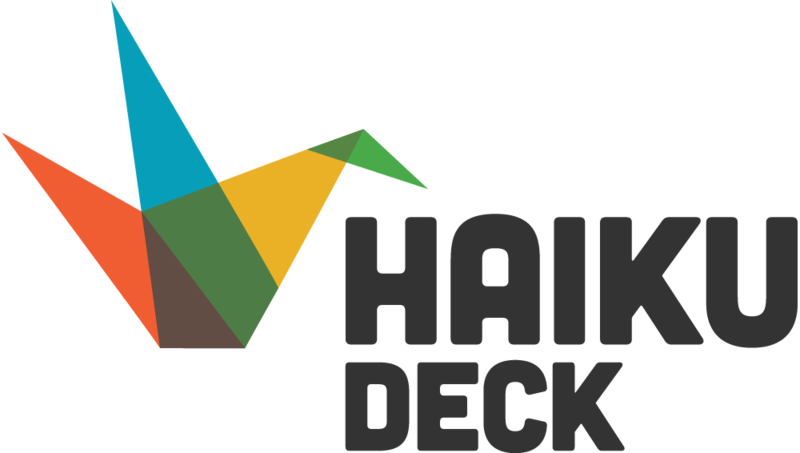 However, this is more of a trial program than a true, free plan, as you are limited to a single presentation, but serves as a good way to get acquainted with Haiku Deck’s interface and its core set of features. This entry-level package is extremely basic and you do not have privacy controls over your slides. As a result, you won’t find features here like custom branding or the ability to embed video as you would in PowerPoint, but you can still use the mobile app. All told, this version isn’t meant for serious business use. The Pro version offers a set of features that would be suitable for any established company, like custom branding, which is missing in the similarly priced Starter version of Slidebean. It also comes with AI assistance from the company’s Zuru assistant. This feature can automatically add images and suggest formats based on your text. In comparison, PowerPoint offers no such AI assistance. Haiku Deck Pro does not include features to gather audience feedback like Google Slides does, or the live polling features like Swipe, either. At $9.99 per month, the Pro version is ideal for Mac users willing to try out an unproven technology and be on the cutting-edge of slideshow building. Haiku Deck Premium gives you priority support, just like the most expensive versions of Prezi and Swipe. It also offers analytics features that tell you the time and location of users who view your slides, at a cost of $29.99 per month. While this is more expensive than PowerPoint, these features make Haiku Deck feel like a more modern solution. However, Haiku Deck Premium still lacks the audience feedback gathering features that other platforms do. It also lacks a large library of templates to choose from like Slidebean. That said, if you want to better understand your audience’s viewing behavior, then Premium is worth considering. Haiku Deck’s iOS apps have intuitive and full-featured presentation tools. It’s unfortunate, then, that there is no Android version of Haiku Deck. Most of the other systems we looked at least offer a presentation viewer on Android. The mobile version of Google Slides may not be as sleek as Haiku Deck, but it works on all major platforms and could be a better fit for those who want to make presentations on an Android device. Haiku Deck’s customers find the system to be easy to use and very straightforward. The library of images that come with the free version lets even tech-illiterate users build attractive slideshows. However, there are some complaints about the lack of customization. Haiku Deck has the best mobile app out of any of the software we evaluated. Additionally, the inclusion of the Zuru AI assistant is a novel feature, and you may very well find it to be transformational in your presentation building. Try out the Basic version to learn more about Haiku Deck today. Canva is a design app that provides tools to build not just presentations, but also infographics, posters, and nearly any other type of sales collateral you’d want to make as a leave-behind. The service, which offers a free version, has all the basic presentation building options, along with collaboration features and a library of affordable stock images. Canva is great for sales teams that want a one-stop shop for building presentations as well as other marketing material. The free version of Canva provides 1GB of online storage for your content. 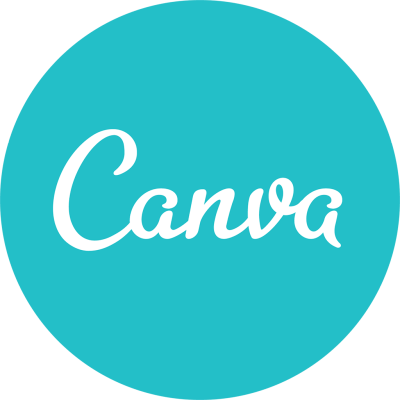 The Canva for Work package costs $12.95 per user per month, which makes Canva one of the more expensive services that we looked at. You’ll have to get in touch with Cava’s sales team for a quote for the Enterprise edition. The functionality of the entry-level, Free version is limited, which is something of an industry standard in presentation software. With that said, you still get access to all of Canva’s 8,000 templates, which is much more than what PowerPoint offers. One GB of data is also minimal when compared to the 15GB offered with every free Google Account. This could be good for trying out the platform, or for simple one-off projects that don’t require advanced features like custom resizing or access to paid stock photos, making it a great option for individuals wanting to use their own images in presentations. Canva for Work provides just about anything your business would need to make professional business content, like support for external fonts, custom resizing, and access to any stock photo in Canva’s library for just $1 each. There are images to match virtually any possible business use case, with more being added each day. In comparison, PowerPoint offers only a small library of subpar artwork. The Canva for Work package lacks the audience feedback features of other systems. Its collaboration tools are limited to internal teams that want to work together to create presentations or marketing materials. Still, Canva is a great all-in-one design platform for creating effective collateral. If you want an easy-to-use tool that allows you to heavily customize your presentations, then this version of Canva is worthwhile. As its name implies, Canva for Enterprise is intended for larger organizations. 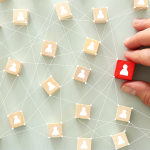 You’ll have to contact their sales team for pricing, but this tier comes with a dedicated account manager as well as administrative controls that let you set permissions on which employees have access to what features. It also has a 99.999% uptime guarantee. PowerPoint offers no such uptime guarantee. 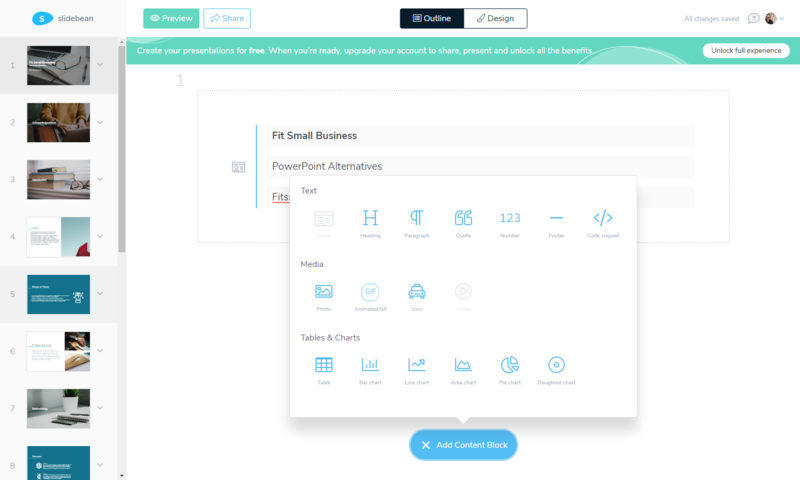 Canva for Enterprise does not offer concrete pricing like other platforms, which can be confusing for many customers. It’s also hard to recommend for those looking to gather insights from the audience. Still, it’s a good fit for those who want a committed account manager to see to their needs when using the product. Canva’s main benefit is that it lets you create other pieces of content like advertisements and social media graphics without needing to use another tool. Its presentation builder is adequate, but it doesn’t offer animations and fonts that look as good as Slidebean and Google Slides. If you don’t need to make sales collateral, those systems are better choices. Our readers say that the range of templates makes it easy to make professional-looking designs without being a seasoned designer. On the other hand, there are complaints that searching through templates is tedious and that navigating through the library of stock images can be slow. Canva is a not just a solid PowerPoint alternative, but an entire creative suite for easily creating powerful marketing content. Whether it’s a slideshow, social media graphics, or a poster, Canva has features that will help businesses of all sizes make effective content. Check out Canva’s website today. Prezi, which offers a free version, is a PowerPoint alternative that takes an unconventional approach to the common presentation. Instead of using slides you go through in order from beginning to end, Prezi uses one very large canvas that the presenter can then navigate through by zooming in and zooming out on content. The software is great for companies that want to quickly change the focus of a presentation or emphasize a key point on the fly. You can use Prezi for free, but storage is limited to 100MB and your content is visible to all other Prezi users in their public Gallery. Prices range from the Enjoy version for $7 to the top-tier, $59 per month, Pro Plus plan. Pricing is in line with other services we compared. The Public, and free, edition of Prezi allows you to create and share presentations just like you would with PowerPoint. You can write text, format it, and insert images as you see fit within the presentation. You can also configure animations between slides. However, unlike other presentation tools, the software is designed to allow you to skip or quickly navigate between content with ease, rather than force you to scroll through a stack of unnecessary slides. Like most other PowerPoint alternatives, Prezi’s Public edition limits you to just 100MB of online storage. It also puts all of your content in a public gallery for all to see. It’s not fit for most business use cases, but it could be worthwhile as a free option for putting together extremely basic presentations with non-sensitive information. At $7 per month, you can keep your Prezi content private and access it on either an iOS or Android app. You also get priority support in case you need help from the company, which is better than what PowerPoint offers. This edition comes at a lower price than similar offerings, except for Google Slides. Unlike Google Slides, however, you cannot crop or touch up images within the app. For that option, you’ll have to upgrade to the company’s Pro plan or above. Prezi Enjoy is good for small teams that want a core set of presentation-building features they can use to create truly unique and audience-tailored presentations, and those who can edit images in another program. For $19 per month, Prezi comes with unlimited storage and the ability to work on projects offline. This makes it similar to PowerPoint, which allows you to store as much media as your machine can handle. You also get access to image editing tools, so you can touch up graphics before inserting them into the presentation. Unlike the Premium version of Slidebean, it does not come with analytics features or external font support. It also lacks access to a library of stock images like with Canva. However, if your team finds itself making presentations with a lot of graphics, then this is worth checking out. Pro Plus is designed for larger teams and adds advanced, hands-on training from the company when you sign up. Prezi staff will personally walk your team members through the system’s features. You’ll get no such opportunity from Microsoft to learn PowerPoint. Prezi Pro Plus is one of the most expensive packages we looked at, and it’s still missing things like the ability to gather audience feedback. Still, it’s a very strong offering. If you want to save yourself the trouble of teaching all of your employees how to use the software, you will likely appreciate Pro Plus. In the right hands, a Prezi presentation can look fantastic. Unless you have a keen eye for design, however, it’s difficult to make a Prezi that doesn’t look cluttered and nonsensical. If you don’t have the skill or the care to make use of Prezi’s nonlinear design, than Google Slide’s conventional, PowerPoint-esque design is a better option. Users who are designers by trade love Prezi and the fact that it allows them to make presentations that go beyond the common slideshow. Regular business users, however, find the builder to be convoluted and say that it is difficult to make good-looking presentations. Prezi is a truly unique PowerPoint alternative. It’s nonlinear approach to presentation design is sure to catch the attention of your audience, and the whiteboard-like system can let creative team members tell captivating stories. Try Prezi for free today. Over the years, PowerPoint has been matched by cheaper, sometimes even free offerings that allow you to make powerful presentations. The fact that these systems are all cloud-based is also a bonus, as you can create and edit content on any device. Google Slides is free to use, highly intuitive, and has all the editing options you’d need to build an effective presentation. Its real-time collaboration features and presenter tools are highly useful, and the fact that you can import templates from a third-party service make it the best PowerPoint alternative on the market today. Visit Google today to get started.